We are delighted to introduce Beverly's International Event Centre, an event center that stands out, a unique top-of-the-range event place at 33-37, Shogbamu Street, New Garage, Gbagada, Lagos in Nigeria. 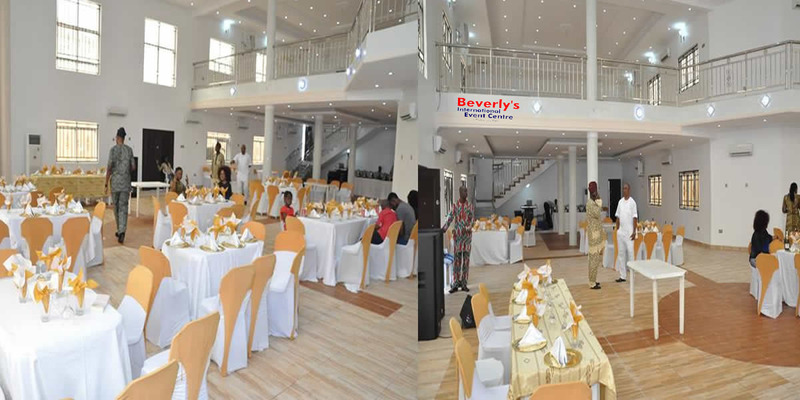 For your Weddings, Birthday Parties, Anniversaries, Corporate Functions, Christmas Parties, Product Launch etc, Beverly's International Event Centre is a place to be. Beverly's International Event Centre makes it easy to host, decorate and customize your events just the way you want it. Our strength is our flexibility, we go the extra mile to satisfy our customers. A home for special & memorable events. The event centre is equipped and peculiar for proffering one stop-shop event service solutions. From hall rental to decoration, from food and drinks catering services to security. Beverly has it all covered especially with our strategic alliance with renowned and seasoned event managers and vendors. 33-37, Shogbamu Street, by New Garage, Gbagada, Lagos-Nigeria. © 2019 Beverly's International Event Centre.